A New Star is Born! Vancouver's Vasek Pospisil, above, took first place in the men's singles after saving 3 match points to beat Briton Daniel Evans, 6-0 1-6 7-5, on Sunday, August 4, at Hollyburn Country Club. The victory boosts his world ranking from 89 to career best 71. His run didn't end here! Next up for Vasek was the Rogers Cup in Montreal. He carried his momentum to win over world No. 20 John Isner, then No. 51 Radek Stepanek, and followed that up with a stunner on Thursday when he knocked off No. 6 Tomas Berdych. Vasek advanced to the semis on Friday when Nikolay Davydenko retired with an injury. He lost to fellow Canadian Milos Raonic in three sets, 6-4, 1-6, 7-6, on Saturday. 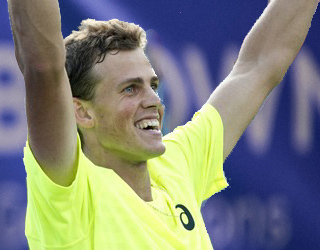 Despite his loss in the semis, Vasek Pospisil moved up 31 spots to number 40 in the world. What an achievement! Photo 1: Although Daniel Evans failed to follow his fellow Briton James Ward, who won the Vancouver Open two years ago, he could become British number two for the first time in his career. Un-seeded Daniel eliminated top seed, Evgeny Donskoy of Russia, earlier in the first round, 3-6, 6-4, 6-4. Photo 2: British number three Johanna Konta won the Vancouver Open women's title by beating Canada's Sharon Fichman, 6-2, 6-4, in the final on Sunday. This was Johanna second title in a week after her victory in Winnipeg. Photo 3: Due to Friday's rain, Toronto's Sharon Fichman had to play three matches on Saturday: singles quarter-finals and semi-finals back-to-back and then doubles final. However, after defeating Date-Krumm, 7-5, 6-3, and Zahlavova, 1-6, 6-4, 6-4, in the singles, Sharon showed no signs of fatigue and won the Women's Doubles Championship with her partner, Maryna Zanevska of Ukraine. They beat American due Jacqueline Cako and Natalie Pluskota in the final. Photo 4: In the men's doubles final the veteran Israeli Andy Ram, left, and Jonathan Erlich took out Toronto's Adil Shamasdin and his America partner James Cerretani, 6-1, 6-4. Photo 5: Opening Night Celebrations on Tuesday, July 31. Photo 6: Frank Dancevic of Niaara Falls, Ont., topped Benjamin Becker of Germany, the third seed, 7-6, 5-7, 7-6, in the second round, but fell to the fifth seed American Bobby Reynolds in the quarters, 6-0, 6-3. In Vancouver, Frank will forever be remembered for his Davis Cup victory over Spain's Marcel Granollers - a win in February at UBC that was the difference maker in Canada advancing to the quarter-finals. Photo 7: North Vancouver's Philip Bester, left, and Filip Peliwo. Bester put up a serious fight against Belgian Olivier Rochus on the centre court in the Monday night feature just a day after winning the Stanley Park Open. Bester fell to Rochus, 6-4, 6-7, 6-3. And as for Peliwo, he lost to fellow Canadian Frank Dancevic, 6-3, 6-4. Photo 8: Go Vasek Go! The crowd was cheering for their local favourite. Photo 9: Ball-boys are at rest and enjoying a good match. Thanks to Robert Exell, Dexter and his parents, David Griffiths and Barbara Docherty, for organizing the ball-crew for this year's tournament.